Until recently, implants have been restored with either PFM structures or removable partial dentures with denture teeth. 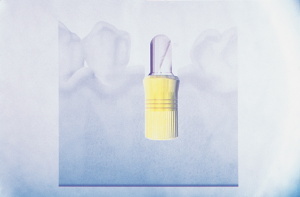 This article describes a new alternative to the implant restorative protocol. Utilizing a new implant system and resin restorative material, it is possible to create a quick, permanent chairside restoration without generating laboratory fees. The following case describes the replacement of a missing lower left first molar with a single implant restored chairside with resin. A 55-year-old male patient presented to our clinic seeking replacement of his lower left first molar. The patient’s medical and dental history was obtained in the usual manner. The history revealed a healthy male with good oral hygiene, with no contraindications to implant treatment. His major concern was to avoid conventional bridging, which required the removal of sound tooth structure. He was not very happy with a conventional bridge on the opposing arch, because of the tooth destruction and the inability to clean the area easily. He stated, "Had I known about implants earlier, I would have never consented to a conventional bridge procedure." The Internet was his source of implant information, not his previous dentist. Figure 1. Periapical radiograph implant selector overlay guide. Figure 2. Surgical stent guiding initial pilot hole. Figure 3. 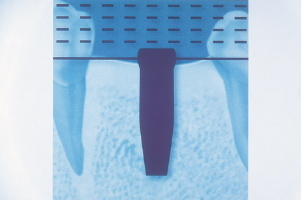 Periapical radiograph with initial pilot hole gauge. Figure 4. Soft tissue circular trephine used to create surgical and implant placement channel.. Figure 5. Implant in place with healing cap in place. Figure 6. Radiograph of the implant at progressive osseointegration evaluation appointment. During the initial visit, study models and a periapical radiograph were obtained.A physical/visual examination was also performed to determine buccal-lingual alveolar bone dimension. With this information and a radiograph overlay implant selector (BASIC Dental Implant Systems), a 4-mm by 15-mm implant was selected for placement (Figure 1).A clear acrylic surgical stent was fabricated to guide the osteotomy drills (Figure 2). The patient was scheduled for a 30-minute surgical implant placement appointment and was anesthetized with local anesthetic in the usual manner. In a matter of minutes, we were ready to proceed. The pilot drill was sunk to the predetermined depth, guided by the acrylic stent through the unflapped gingival tissue. Because the amount of available bone was quite abundant in this particular case, flapping was unnecessary. It has been my experience that whenever possible, flapping the tissue should be avoided to minimize discomfort and to speed healing time.1 Utilizing a conservative surgical placement procedure greatly diminishes chair time and the patient's reliance on analgesics postoperatively. 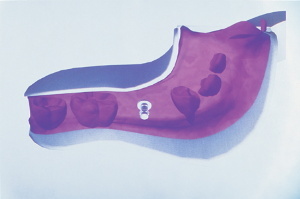 final enlargement was performed through this conservative channel, precisely matching the diameter and depth of the implant. 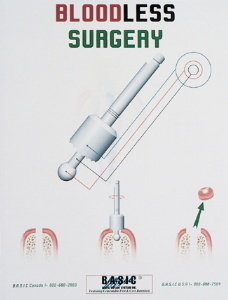 The BASIC implant used in this case is a self-tapping stage-one implant that is screwed into place with a simple ratchet. 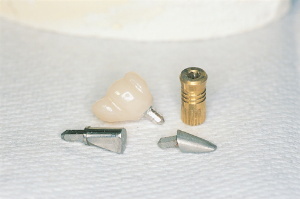 This particular implant system is unique because it utilizes a hex-recess hole that accommodates resin cementable customized posts and cores.3 Because this particular protocol is so quick, simple, and conservative, it is possible to obtain impression records of the implant site and the opposing arch at the time of surgery. 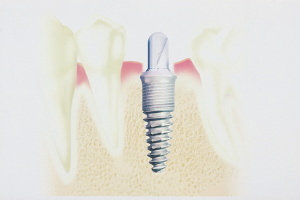 Thirty minutes is more than adequate time required to perform this phase of the implant treatment ( Figure 5). The patient was dismissed with a prescription for a 10-day supply of antibiotics and mild analgesics. Analgesics are used as required.4 The patient was instructed to return at 2 months to verify progressive osseointegration was taking place. There is no need to see the patient earlier unless problems arise as described in the patient's home literature. At 2 months the patient returned for a quick, 5-minute examination. A periapical radiograph was obtained to verify an intimate bone-to-implant surface contact. The implant was also examined physically and visually for mobility, pain, and signs of infection. If the examination demonstrates a lack of mobility, pain, and/or infection, and demonstrates intimate bone-to-implant contact, progressive osseointegration; is established, paving the way for prosthetic delivery (Figure 6). Figure 7. Implant with IPTD firmly seated into place prior to impression. Figure 8. Impression with IPTD re-indexed back into the impression. Figure 9. Impression with IPTD and implant analog prior to adding stone. Figure 10. Stone model ready for prosthetic fabrication. Figure 11. Prefabricated post and core prior to modification. Figure 12. Post and core before and after modification, and post and core with resin crown. 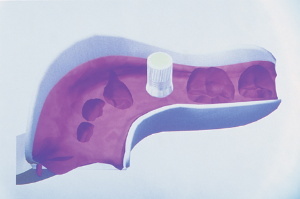 The spatial position of the implant was obtained by simply seating the implant position transfer device (IPTD) into the implant and impressing with polyvinylsiloxane impression material (Figures 7 and 8). 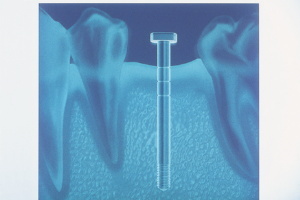 The IPTD does not usually dislodge when the impression is unseated because of its tight fit in the implant. 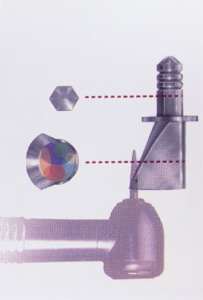 The IPTD was simply indexed back into the set impression with the analog fully seated onto the stem (Figure 9). Cyanoacrylate was flowed into the IPTD analog and the impression to eliminate possible movement during transportation to the lab and pouring of the working model. The working model with the analog precisely embedded was now ready for prosthetic fabrication (Figure 10). 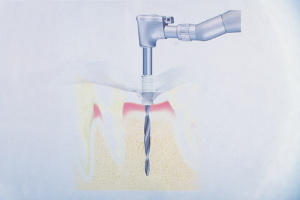 BASIC's unique prefabricated post-core is designed to allow core customization, up to 20º from the long axis, by simply cutting it back as desired with a dental drill (Figure 11). In this particular case, the models were returned, and the post and core were customized in the clinic in a matter of minutes. A clear plastic crown form with corresponding anatomy to the missing tooth was selected and trimmed to fit the customized post and core. With the customized post and core seated (not cemented) into the analog, the trimmed crown form was loaded with resin of appropriate shade and seated over the modified core. The resin was light cured onto the core and removed from the model. 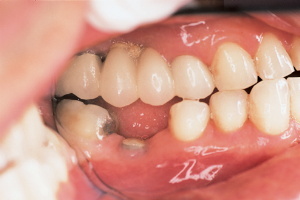 The resin crown was then completely cured from all aspects, trimmed, and polished. 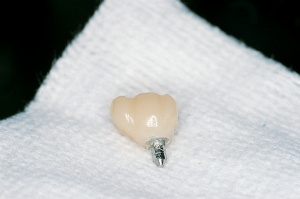 The resin crown and the post and core were now ready for cementation with resin cement to the implant (Figures 12 through 15). 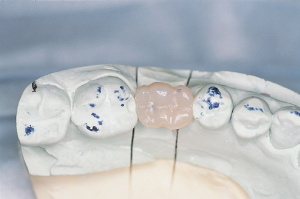 Palfique resin restorative material (J. Morita) was chosen because of its aesthetics and finishing properties. The resin's spherical filler allows much faster finishing to chameleon-like shade match when compared with those utilizing traditional nonspherical filler. Polishing was accomplished quickly with dry pumice followed by wet pumice in a slow-rotating white prophy cup. Figure 13. Note periodontal-friendly crown design. Figure 14. Side view of crown on model. Figure 15. Occlusal view of the restoration with broad contact areas. Figure 16. 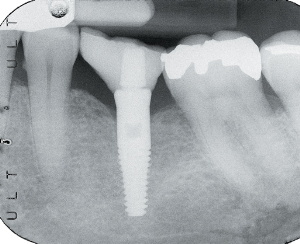 Periapical radiograph of the restored implant. Figure 17. Restoration cemented into place. The patient was now scheduled for a 30-minute prosthetic seating appointment. It was not necessary to anesthetize the patient for this phase of the treatment. The healing cover was removed, and the hex hole recess in the implant was gently dried. A small amount of resin cement was dispensed, mixed, and applied to the hex hole recess in the implant with a slender, pointed resin application brush and wiped onto the inner walls of the hex hole in a circular motion. 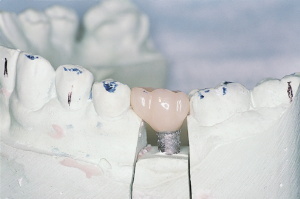 The resin crown post;core assembly was then seated into the implant and allowed to set. 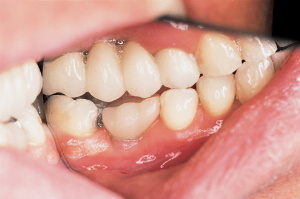 Cement flash was removed, and if required, the occlusion was adjusted at this time. For this case, Rely-X resin cement (3M ESPE) was chosen for cementation because of its ease of use and excellent performance (Figures 16 and 17). It is possible to fabricate excellent single-unit restorations, without the participation of a dental laboratory, quickly and easily. This protocol is highly profitable and versatile when compared with traditional laboratory restorations. It is very easy to customize the shade and anatomy when the dentist has complete control at chairside. 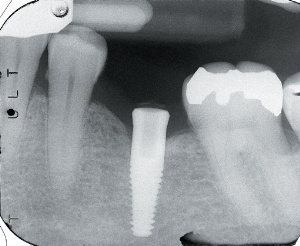 For single-implant situations, when the path of insertion is favorable, this protocol is a highly effective and desirable alternative to other methods of implant restorations. Hoag PM, Donnenfeld et al. Alveolar crest reduction following full and partial thickness flaps. J Periodontol. 1972;42:141-144. Dr. Fernandes is in full-time general dental practice in Winnipeg, Manitoba, Canada. He has a special interest in dental implantology in general practice.